Industry leaders meet for an exclusive, invitation-only event that explores the topics that are redefining home health and hospice. 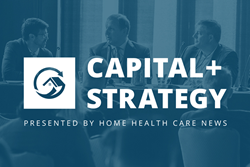 Home Health Care News (HHCN) is pleased to launch the inaugural Capital + Strategy Forum on April 10, 2019, in Washington, D.C.. This full-day event attracts home care, hospice, private duty, investment bankers, insurance industry and health system executives looking to acquire actionable intelligence on how to drive organizational growth and stay on top of sector evolutions. The conference agenda covers the changing dynamics and innovations propelling change in the home care and hospice sectors. Speakers will tackle industry disruption, joint ventures, sales and marketing tactics, M&A, new operating models and much more. View the conference agenda here. Given venue capacity and the desire to create an intimate atmosphere, the Capital + Strategy Forum is by invitation only. You can request an invitation by visiting strategy.homehealthcarenews.com. The Capital + Strategy Forum will take place at the Spire in D.C.’s NoMa neighborhood. This gorgeous, modern venue has brilliant glass-paneled meeting rooms outfitted with state-of-the-art technology, stunning artwork and luxe patios with panoramic views of the nation’s capital. If your organization has a solution or service which may benefit our attendees, there are numerous sponsorship options that can foster brand and business development. Capital + Strategy sponsors gain the opportunity to showcase their brands and develop relationships. If you are interested in hearing more, please call (312) 809-5755 or email info@homehealthcarenews.com. The HHCN Capital + Strategy Forum is an intimate, invitation-only gathering taking place April 10, 2019, in Washington, D.C. This one-day seminar attracts professionals from the home health, hospice, private duty, investment banking, insurance and health systems to network and hear expert speakers discuss the topics that are redefining the sector. Aging Media Network is a digital media company based in Chicago, Illinois, and is the publisher of Senior Housing News, Skilled Nursing News, Reverse Mortgage Daily and Home Health Care News. Home Health Care News (HHCN) is an independent source for breaking news and up-to-date information covering the home health, private duty and hospice industries. HHCN’s coverage spans the home care world specifically, from large, national service providers to independent care companies. Its news and perspective gives industry professionals the information they need to make the best decisions in their day-to-day business operations.